Today, Iron Bonehead Productions sets April 14th as the international release date for Naudiz's highly anticipated second album, Wulfasa Kunja, on both CD and vinyl LP formats. 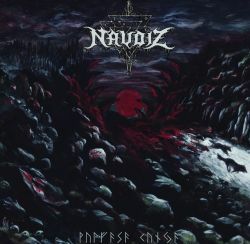 One of best-kept secrets in the black metal underground, Naudiz hail from Italy but exhibit a sound that spans countless locales and eras. Naudiz was never born, but exists since Nifelheimr, the primordial land of eternal ice, and Muspelheimr, the primordial land of neverending fire, collided. The first sonic approximation of such came in 2014, with their Aftur till Ginnungagaps debut LP. Proudly pagan at heart and yet exuding an especially gritty aspect otherwise elusive to metals branded "pagan," Aftur till Ginnungagaps was a fortuitous introduction to this power-trio. With Wulfasa Kunja, however, Naudiz eclipse that accomplishment with a stately sort of black metal, pounding and pulsing and - yes - PAGAN, but with an even-more-righteous covering of dirt and grime. Across nearly 40 minutes, its eight component songs patiently build with a master's touch, weaving spells of mystery and might, often before exploding into dizzying vortexes of barbaric splendor. Grim yet robust and unapologetically physical, the ruminations of "bedroom" black metal are not for Naudiz; their execution is rough and rowdy and red-blooded. And with lyrics all written and gesticulated in ancient Norse, Wulfasa Kunja becomes a totem unto itself, duly completed by cover artwork by the masterful Timo Ketola.